Prof.Suk published an article entitled as. 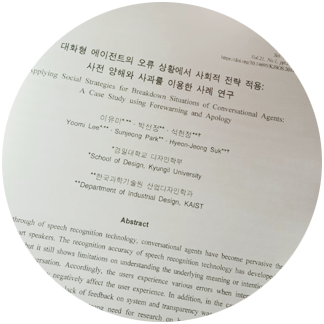 “Applying Social Strategies for Breakdown Situations of Conversational Agents: A Case Study Using Forewarning and Apology [대화형 에이전트의 오류 상황에서 사회적 전략 적용: 사전 양해와 사과를 이용한 사례 연구]” in the Korean Journal for Science of Emotion and Sensibility. The study documents Prof. Yoomi Lee and Miss Sunjeong Park’s term project of research methodology course led by Prof. Suk in Fall, 2017. With the breakthrough of speech recognition technology, conversational agents have become pervasive through smartphones and smart speakers. The recognition accuracy of speech recognition technology has developed to the level of human beings, but it still shows limitations on understanding the underlying meaning or intention of words, or understanding long conversation. Accordingly, the users experience various errors when interacting with the conversational agents, which may negatively affect the user experience. In addition, in the case of smart speakers with a voice as the main interface, the lack of feedback on system and transparency was reported as the main issue when the users using. Therefore, there is a strong need for research on how users can better understand the capability of the conversational agents and mitigate negative emotions in error situations. In this study, we applied social strategies, “forewarning” and “apology”, to conversational agent and investigated how these strategies affect users’ perceptions of the agent in breakdown situations. For the study, we created a series of demo videos of a user interacting with a conversational agent. After watching the demo videos, the participants were asked to evaluate how they liked and trusted the agent through an online survey. A total of 104 respondents were analyzed and found to be contrary to our expectation based on the literature study. The result showed that forewarning gave a negative impression to the user, especially the reliability of the agent. Also, apology in a breakdown situation did not affect the users’ perceptions. In the following in-depth interviews, participants explained that they perceived the smart speaker as a machine rather than a human-like object, and for this reason, the social strategies did not work. These results show that the social strategies should be applied according to the perceptions that user has toward agents.